Get the most of your ONE+ batteries with the RYOBI 18V ONE+ brushless tools combo kit. Each tool’s engine has been engineered as brushless, reducing internal wear and friction. This increases the output of power, the durability of the engine, and the overall running time of each item. With these 4 high-quality tools, you’ll be ready for any DIY tasks – big or small. The ONE+ circular saw achieves 30% faster cutting than a brushed equivalent. The impact driver’s sophisticated Deck-Drive system powerfully drives screws until just before the surface, when it reduces speed to minimise surface damage. For even bigger jobs, the hammer drill driver has the power and control to handle all surfaces – from the toughest to the most fragile. And to finish off your projects, the ONE+ angle grinder’s anti-kickback protection helps you achieve professional results with minimal risk. 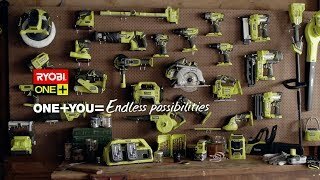 All powered by any ONE+ battery in the range, the RYOBI ONE+ brushless tools combo kit is the most efficient collection from the ultimate tool range. Grab your RYOBI 18V ONE+ brushless tools combo kit from your local Bunnings Warehouse today.